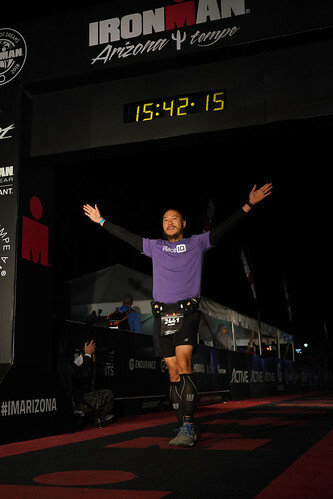 Arizona was my fourth planned Ironman race (2.4 mile swim, 112 mile bike ride, 26.2 run with two wardrobe changes in a 17 hour time limit). 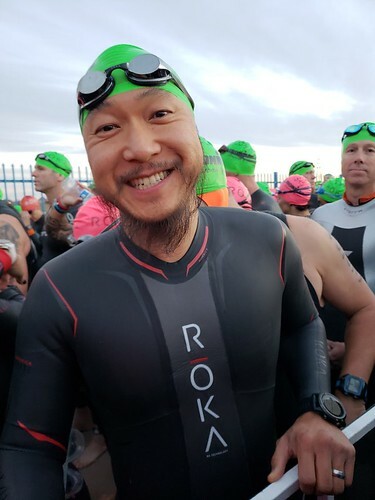 I am a “just finish” back-of-pack triathlete so I was not going to stress out or pretend that I have any chance to compete in my age group (40-44) for a Kona spot (triathlon world championships). I did have desires to try a more flat course after Lake Placid so this course and the weather conditions were appealing. I used the just finish program from Don Fink’s Be Iron Fit book and adjusted it to my schedule (life does a good job getting in the way, so I skipped a handful of workouts); I averaged 7-10 hours a week. During the summer, I was swimming daily, then 2x a week up to the race. Running-wise, I was hitting the pavement 3x a week. Cycling-wise, I was on a spin bike 2x a week (watching GCN network HIIT youtube videos) then an outdoor bike ride on the weekends. 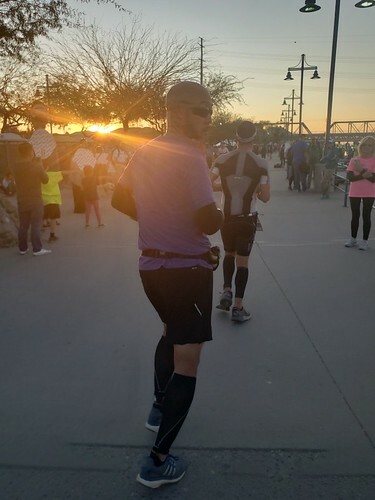 I did a bunch of 50 milers but never did more than a 60. 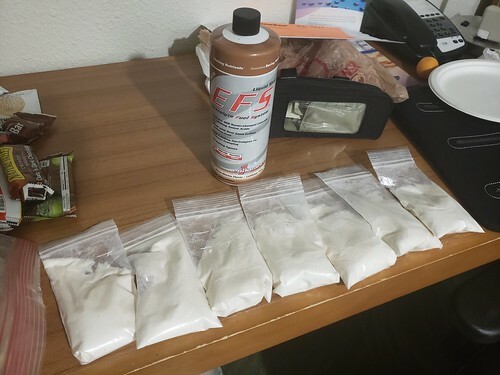 For nutrition, I practiced with a liquid only diet: EFS-Pro. It seemed to work well on my training rides. 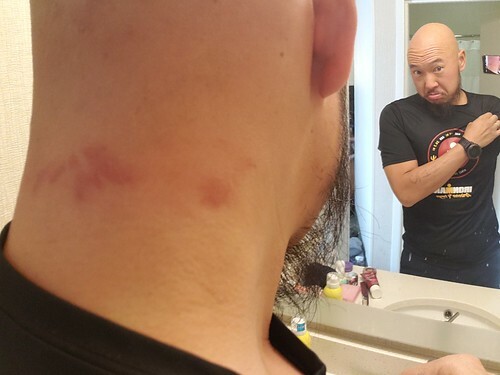 I flew into PHX on Thursday and checked into the SpringHill Suites. 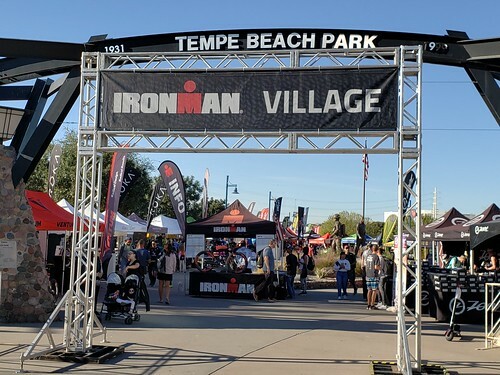 I checked into Iron Village quickly and it was surprisingly empty. 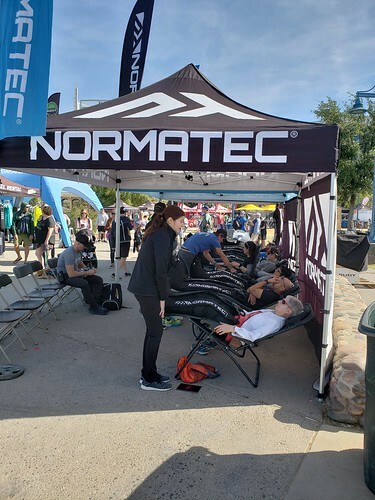 The Normatec tent was always busy. I picked up my bike from TriBikeTransport and road it back to the hotel. On Friday, I took a short 20 mile ride see see some of the course, then a 4 mile run. 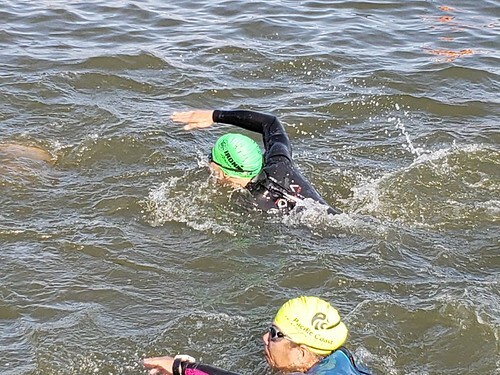 On Saturday, I participated in the mass practice swim. What murky water! Anyway, I dried up then chilled out. Here I am with the mandatory bike and gear bag checkin. 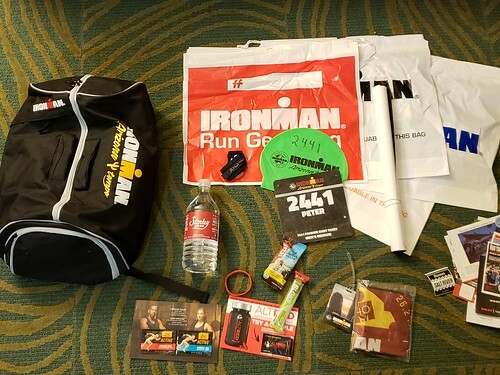 Checking in gear bags was a new policy in 2018 (this used to be done on race day). 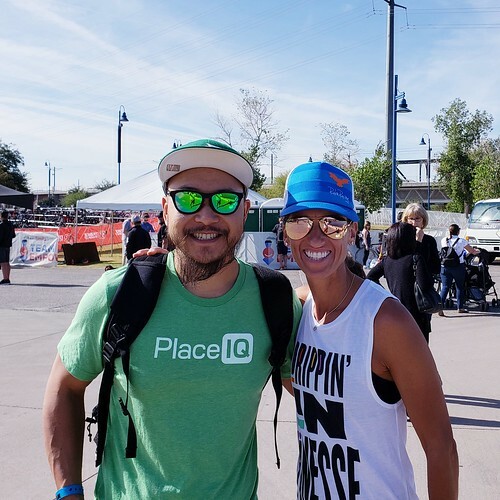 I got to meet the great Coach Jen Rulon! 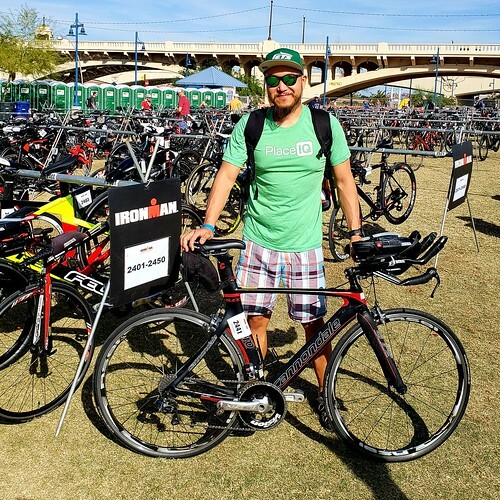 (14x Ironman and a renown triathlon coach). I woke up at 2:59 AM. Without fail, I never slept well before a race (I plan on sleeping in the previous days). I ate a bagel, stretched, gulped some EFS-Shot and coffee. 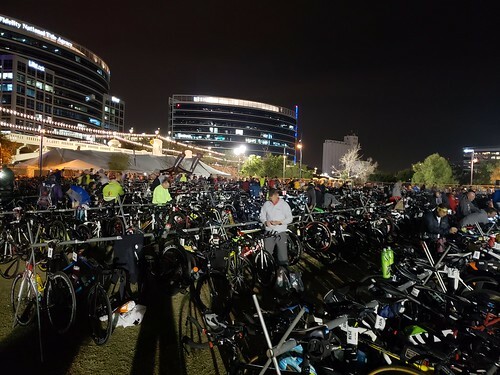 I took the shuttle to transition, checked my bags and my bike. Pumped air into my tires. 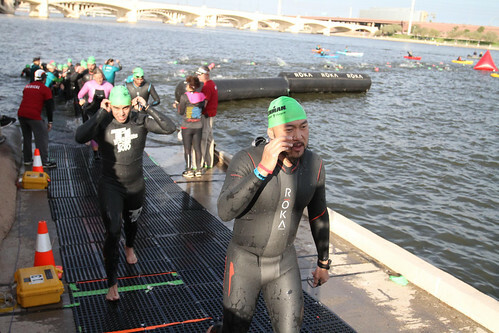 Got my body markings then put on my wetsuit and started the walk to the start corral. I seeded myself in 1:20 area. 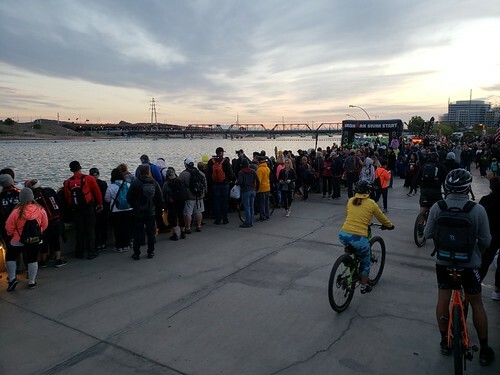 The corrals got crowded quickly and late comers started hopping over the gate. A handful of late comers also pushed their way up to the front. After the singing of the nation anthem, and the pro starts, the line started to move. I gave Mike Reilly a high five. I kicked off my Old Navy flip flops and started the water wrestling. My goggles fogged up. 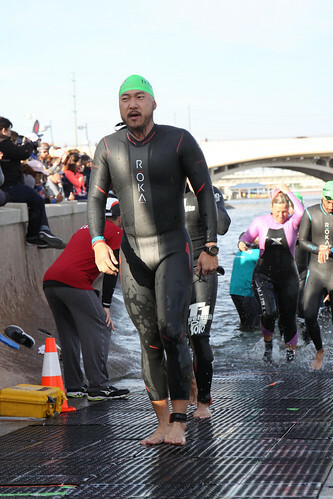 Unlike other IMs that give you 15 minutes on race day to get your body acclimated, the only practice swim was the previous day. It was colder today too, so my body was in shock. Between my goggle fog and the murky water, I was feeling like a kid who forgot how to swim. I was very thrilled at the fifth red buoy, as this signaled the end of the swim program. It was a clusterf-ck here, since there was a crowd here jockeying for position, heading left back to the stairs. 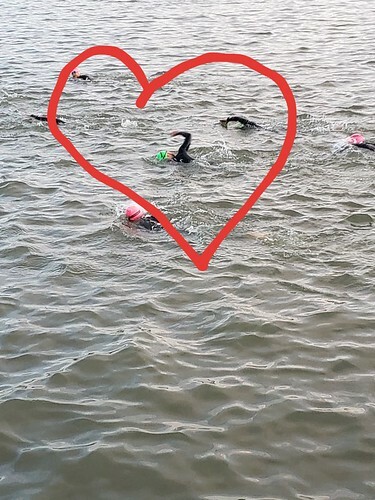 My swim was awful and slow but I was relieved that was over. The jog back to transition seemed like a never ending road. I was looking forward to the wetsuit strippers/peelers. After quick removal, I jogged, grabbed my bike bag and went into the crowded tent. Thank you volunteers! No problem here, I had to spend time drying up completely before getting into bike gear. One dude was shivering in silence for five minutes. Poor dude. I got into my bike clothes, strapped my helmet and started jogging to the mount line. I saw my wife, got a good luck kiss and started the ride. 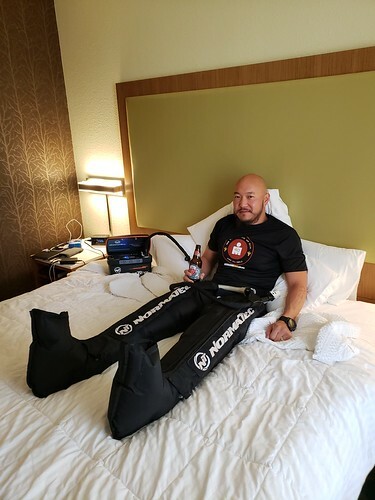 My strategy was simple – I was not going to overcook my legs: take it easy on loop one, no matter how pride gets beaten… then save some juice for loops 2 and 3. Many folks passed me on the first loop. There were a lot of (illegal) draft packs! After the first turnaround, I was moving faster. 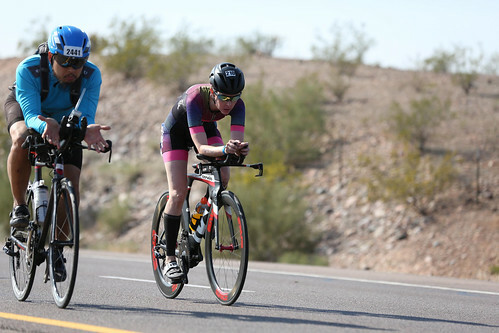 I passed ten people in 30 seconds *insert ego boost*, at least… only to be passed by a 54 year old woman *remove ego boost* (athlete ages are prominently marked on the calf). Ok, settle down, buddy. Let’s get back to basics. The headwinds were there, but I kept spinning. I stopped at aid stations to either blow my nose, refill my between the bars bottle with water and liquid nutrition or to take a potty break. On loop three, it was more of the same with exception to the change in wind direction. 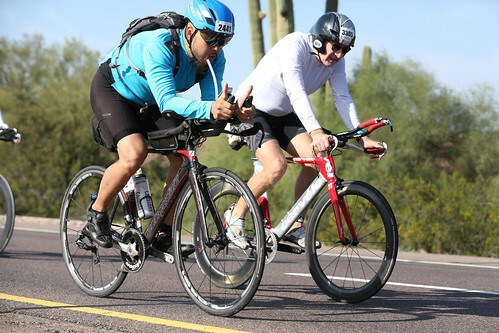 I noticed the FinisherPix camera men were no where to be found and biker volume decreased. Ok, power through… back into town and into the bike corral. I dismounted and handed my bike off to a volunteer. Onto the changing tent! 112 miles done! The bike course seemed fair and painfree. No complaints. 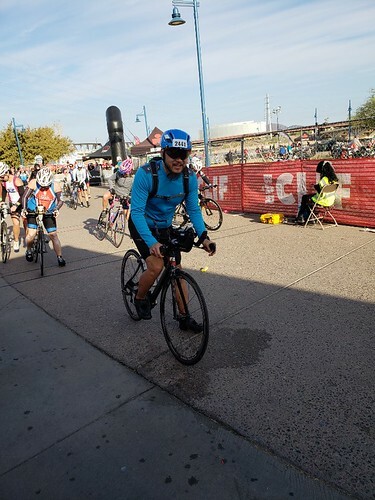 Happy to be done with the bike and onto the last leg of the race. The sun was still up! I changed quickly and got into my run gear. Run out, game on! I got this! The first four miles of the run seemed ok. My wife and friend Cam waved and I felt good. I stopped for a selfie. I told myself, “no walking unless it’s an aid station.” That dream died at mile six. My legs were dying… and the sun had set. Darkness. Miles 6 through 14 were run-walks. 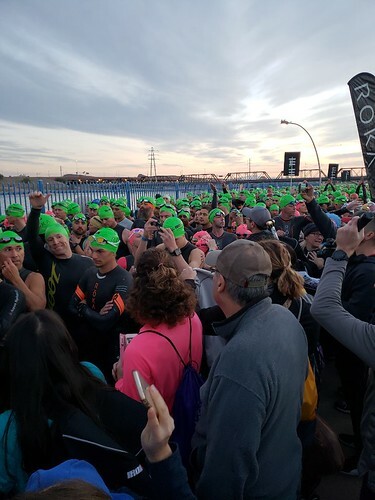 “How are you doing?” It was Coach Jen Rulon smiling next to me at mile 13. “Thanks…” I whined and hobbled along. Mile 15 through 21 were “power” walks. My body wanted none of this but I kept moving forward… slowly. Turtle power. I knew a sub 15 hour was out of the question now. At mile 20, I abandoned my nutrition and started drinking red bull, chicken broth, cola. They were delicious. My Garmin Fenix 3 gave me the “low battery” notice. There goes my pacing. Mile 22 to 25 were the return of run-walking. Still not thrilled with myself. 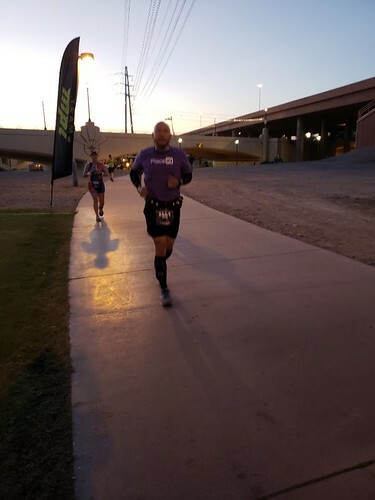 I was disappointed in my run performance so at mile 25 I picked up the pace and did not stop for the rest of the race. 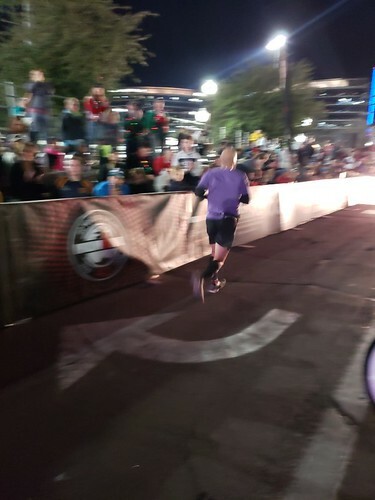 I was back up at a 10+ min/mile but it seemed like I was the flash… I was passing a lot of walkers; I received good cheering support and a bunch of “wows” as I was breathing heavy and moving towards the finish line. 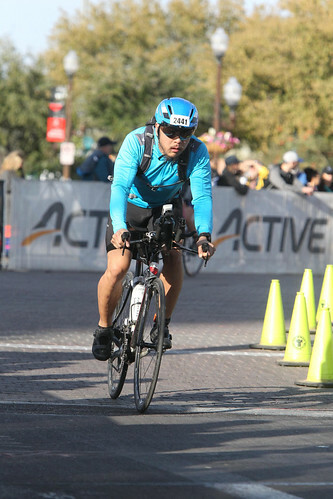 Although flat and not my first time, there is no such thing as an easy one… this course was no walk in the park. Besides the transition times, I only met the run goal. I will train harder for the next one. I needed a minute to regroup, since I gunned that last mile and felt like I was going to puke. Luckily those feelings subsided after a sip of water. My handler also helped me adjust to reality as we kept talking. 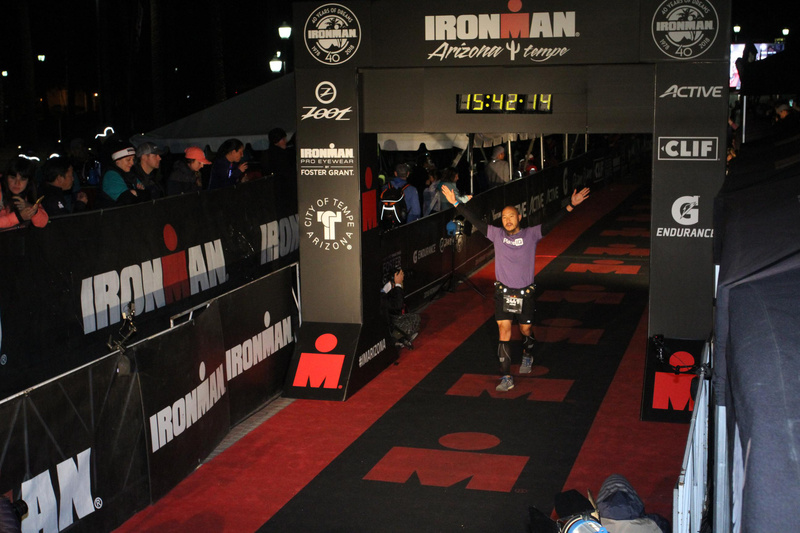 I posed for my staged FinisherPix photo with the IM backdrop. I grabbed my morning, bike and run bags and dropped my bike off to TriBikeTransport. It was such an awesome feeling, with time leftover. My legs felt pretty good thanks to all that walking. I found my wife and friend Cam and we walked down Mill Ave to find real food and a celebratory beer. I went up north to celebrate in Sedona, then flew back to NYC for Thanksgiving with the family. I will start planning for next season: maybe Louisville or Florida.